Today's travel section of The Boston Globe has an article I wrote about Croke Park in Dublin. Croke Park is Ireland's premier sporting stadium and the site for the country's All-Ireland finals in hurling and Gaelic football. This year, the hurling final is September 7 and the football final is September 21. Still looking to find the name of a good pub in Boston that will be filled with Irish supporters watching the game. Click here for the article. The NFL season just about ready to kick-off (hooray! ), and football's biggest fans are probably the most excited. I wrote profiles of three of the NFL's most colorful fans for espn.com, and you can check out the profiles of these Vikings, Chiefs, and Broncos fans on the ESPN web site. They definitely prove their fandom by their game-day personas and their journeys of hundreds of miles to and from the stadium. If you're interested in a good meal this Labor Day weekend, more than 65 restaurants in Boston will extend their Summer Restaurant Week menu at least through September 1. Diners will enjoy 3-course lunches for $20.08 and/or dinners for $33.08 at restaurants throughout Boston, Cambridge, the suburbs and beyond. Price is per person and excludes beverage, tax and gratuity. Offer cannot be combined with any other offer or promotion. Restaurant Week Boston® is a perfect time to sample new restaurants and visit old favorites as chefs prepare delectable 3 course meals for your dining pleasure. For a list of extending restaurants, visit www.bostonusa.com/rw08/ext.html. The U.S. Open begins play today at Flushing Meadows Park in New York City. Each of the four Grand Slam tennis tournaments take on the personality of its host city, and the U.S. Open is no different. The U.S. Open embodies the distinctive character of New York City— noisy, flashy, celebrity-laden, expensive, fast-paced, pressure-packed, and unabashedly commercial. Advertising is plastered everywhere. Players dress like runway models. Airplanes fly overhead. Trains rattle by. Crowds can be rowdy— by tennis standards, of course. “Quiet please” is just a suggestion. Get close to the action in the Grandstand or Louis Armstrong Stadium. Arthur Ashe Stadium is so cavernous that it’s impossible to get close to the action. Instead, check out the action on the Grandstand or Louis Armstrong Stadium, both of which host plenty of top players, particularly in earlier rounds. The Grandstand may provide the best seats in the house. It’s a very intimate setting, and all seating is available on a first-come, first-serve basis. Seats on the west side of the Grandstand have backs and provide comfort in the shade. Outside of limited reserve seating behind the baselines, seating in Louis Armstrong Stadium is general admission as well. The upside of the open seating in Louis Armstrong Stadium and the Grandstand is that you can get extremely close to the action. The downside is that if you’re on your own, it’s going to be tough to keep your seat if you want to get something to eat, use the facilities, or check out other matches. Plus, it’s possible that all the seats may fill up for attractive matchups and close matches, leaving you shut out from getting into Louis Armstrong Stadium or the Grandstand. So if there’s a match on the courts that’s a must-see in your eyes, try to grab a seat during one of the prior matches. Get a birds-eye view. If you climb to the top row of the east side of Arthur Ashe Stadium, you’ll be able to look in on Louis Armstrong Stadium and other outer courts. Also, the outer east concourse of the upper level of Louis Armstrong Stadium gives you a direct view down to the Grandstand, providing a very unique perspective. Come prepared for the weather. If you’re attending a day session, wear plenty of sunscreen and a hat as you’ll be completely exposed in most seats. (On a sunny day, a baseline seat on the south side of Ashe Stadium will provide you with some shade.) Bring sunglasses as well, particularly if you are in Ashe Stadium facing west. The sunset over Manhattan can be a great sight, but it also makes it a little difficult to catch the action below. If you’re going to an evening session, you may need to bring a jacket because temperatures can drop and the wind can pick up, particularly at the top of the stadium. Also, be prepared for rain. It’s nothing like Wimbledon, but there can be periodic rain showers, and unlike grass and clay courts, the hard courts at the U.S. Open take some time to dry before play can resume. So bring some rain gear, and if you know that rain is likely, you may want to bring a book, magazine, or newspaper as you may have more time than you’d like to catch up on some of your favorite reading material. Follow the rules if you bring a bag. All fans and bags go through a screening process before passing through the entry gates. That can mean long lines to get in, but there is an express line for fans without bags. There is a limit of one bag per person, and bags must be single-compartment and must not be larger than 12 inches wide by 12 inches high by 16 inches in length with only one compartment. There is no bag storage on the ground, but there is a bag check facility outside the grounds that is available for a fee. Knapsacks and backpacks are not allowed. Also prohibited are hard coolers, glass bottles, cans, alcoholic beverages, radios, televisions, video cameras or recording devices, signs or banners, and computers. Food is only allowed in small quantities or for medical, dietary, or infant purposes. And yes, you’ll have to leave your tennis racquet at home, too, if you were thinking about getting in a quick set. Rackets are not allowed. Check here for more rules of entry. Print out your draw sheets the night before. The USTA publishes draw sheets listing match schedules and court assignments on its web site the night before the day session begins. Printing it out the night before allows you to scout out what matches you want to see, and it can help save you a few bucks, too, since you won’t have to buy the official draw sheet. Autograph hunting. While security is usually tight around the players, you have a good chance at scoring some autographs, even from the stars. One of the best places to get close to the players is on the practice courts. There are five practice courts on the west side of Arthur Ashe Stadium, although there is only limited access to the players entering and leaving these courts. (You can get a good view of the practice courts from the bleachers above Court 4.) Courts 5, 12, and 16 are also often used as practice courts, and these will provide more access to players, as will two practice courts adjacent to Court 12. Players will also sometimes sign on their way in from the parking lot near the west gate to the tennis center. Take a walk in the park. A trip to the Open provides a chance to explore Flushing Meadows-Corona Park, a location that tourists to New York City often miss. Flushing Meadows was once a former dumping ground, immortalized by F. Scott Fitzgerald as the “Valley of Ashes” in The Great Gatsby. It was transformed into the largest park in Queens and the site of the 1939 and 1964 World’s Fairs. Now, it is home to a zoo, botanical garden, and museums that rival those in the rest of the city. Here's more on some of the sights to see in the park. Today's travel section of The Boston Globe includes an article I wrote on Flushing Meadows-Corona Park in New York City. As I wrote in the article, Central Park is the city's most famous park, but Flushing Meadows offers a more authentic slice of the Big Apple. It's not the backyard for the city's ultra-rich and famous but the working-class immigrants who have made the city such a great melting pot. Click here to read the article. There was an interesting story in the news this week relating to the Abigail Adams Cairn, which I mentioned back in May. A masonry team has been working on the cairn to reconstruct and restore it. In the course of their work, they discovered a metal box inside the cairn that appears to be a time capsule. The Patriot Ledger has more on the find along with some great PDFs from their editions back in 1896 when the cairn was dedicated. UPDATE: The time capsule has been opened, and the contents have been revealed. Ever since 1,000 Places to See Before You Die became such a smash hit, there have been an avalanche of books with a similar concept in many genres. I must admit I love these kind of books, so I was really eager to read 101 Baseball Places to See Before You Strike Out (clever title) by Josh Pahigian. Part of the appeal of these books is a) to see how many of these places you've been to; b) see which places the author deems to be worthy of inclusion and which you would have had on the list; c) and learn about some hidden gems that you should include on your personal list of must-see attractions. I was surprised to find that I've only hit 17 of the 101 places listed in the book, and that's only because last month I added Monument Park, the Yankee Tavern, and Babe Ruth's Grave to the list. I certainly have my work cut out for me. As for the places on the list, they are very eclectic, from the obvious (the Green Monster, Hall of Fame) to the obscure (Recreation Park in Visalia, California) to the commercial (Lenny Dykstra's Car Wash) to the bizarre (the infamous Alcor Life Extension Foundation). I couldn't think of too many places I would have added. Probably would have had a couple more major league ballparks (there are far more minor league parks on the list) such as Dodger Stadium (the L.A. Memorial Coliseum where the Dodgers originally played is on the list) and PNC Park in Pittsburgh for the great ballpark, but the point wasn't to load it up to read like a major league road trip. I also would have included some sights in Japan (Koshien Stadium for one) and elsewhere around the world (San Pedro de Macoris in the Dominican Republic that has turned out an inordinate number of major leaguers and is known as the the "City of Shortstops"). 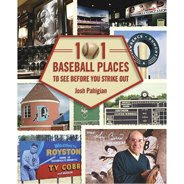 Among the hidden gems in the book are the Crosley Field replica in Blue Ash, Ohio, the remains of Cleveland's League Park, and the site along the Delaware River where the mud that is used to rub up the baseballs in the major league comes from, a gem so hidden that no one really knows where it is. Here are the places on the list with a Red Sox connection: The Green Monster, The Huntington Avenue Grounds on the campus of Northeaster (which has a statue of Cy Young), The Babe Ruth Birthplace and Museum in Baltimore, Babe Ruth's grave in Westchester County in New York, McCoy Stadium (home of the Pawtucket Red Sox), the Baseball Reliquary in Los Angeles (which displays quirky artifacts such as the thong of Margo Adams), the Ted Williams Museum and Hitters Hall of Fame in Tropicana Field, Alcor, Mike Greenwell's Bat-a-Ball and Family Fun Park in Cape Coral, Florida, and Bucky Dent's Baseball School in Florida (which has a replica of the Green Monster). The Cape Cod League is on the list as is The Irvin Allen Jr. Braves Museum in Atlanta, which has artifacts from the Braves' former days in Boston. If you're a baseball fan, this is a book you really want to check out. The Island Alliance has recently put up some wonderful banners on the Northern Avenue pedestrian bridge (the bridge next to the Barking Crab and the Moakley Courthouse) to promote the Boston Harbor Islands. About 10 of my photos were used on the banners, including large photos of cormorants on Little Brewster Island for the "bring friends" banner and the ruins of the mess hall on Bumpkin Island for the "explore" banner. Amazing to see these photos blown up to super size when I'm so used to seeing them on my computer screen. If you're down along the waterfront, check it out. Interesting article in the Waltham Daily News Tribune the other day that visitation to the Boston Harbor Islands is up this year. Good to see that the increase in ferry prices didn't have too much of a dampening effect, and it's nice to see people in metropolitan Boston getting out these great resources that are right in their backyard. Hopefully some of these island visitors are toting a copy of Discovering the Boston Harbor Islands. I've also heard anecdotally that boat traffic in Boston Harbor is down around 40% this year, no doubt in large part to the increased fuel prices. Amazing if that is true. As all baseball fans know, this year marks the final season of venerable Yankee Stadium. I was fortunate enough to get in on one of the tours of The House That Ruth Built last weekend to see the place one final time before it gives way to the new stadium that is rising across 161st Street. From the outside, the new Yankee Stadium looks as if its the older structure with its return to the classic facade with the stadium named etched in gold. Although it's always sad to lose the history of the old ballparks, that is one definite improvement over the current Yankee Stadium. le at 9 a.m. on days of tours at the advance ticket window. But you'll probably need to get there early. On the day we went, people were lining up before 6:45 a.m., and people who arrived after 8:30 a.m. were shut out. The access that is granted on the tour is pretty good, but it was a big group of about 60 people, which meant we didn't have a lot of time to wander in Monument Park, which was the part of the stadium I was most interested in seeing. The tour took us up to the press box, which has a fantastic panorama of the field and into the Yankee dugout. (I didn't try to high step and jump over the fence like Derek Jeter, which was probably a good decision.) We also got to walk along the warning track along the outfield wall. It was neat to see all the circular dents in the wall, which appeared to be painted, from outfield shots. Monument Park is an impressive place to visit, even if you're not a Yankee fan because the Yankee greats are a cavalcade of some of the best who ever played the game. I hadn't realized that the only true monuments in Monument Park honor just five greats: Babe Ruth, Lou Gehrig, Joe DiMaggio, Mickey Mantle, and Miller Huggins. There are plaques that honor other members of the Yankee organization, and a long row of numerals on pinstriped circles in Monument Park looks like the winning numbers for some new pinstriped game from the New York State Lottery, but they contain the team's 16 retired numbers. Not bad when you can have Ruth's retired number sandwiched between the display for Gehrig and DiMaggio. After the tour, we ducked into the Yankee Tavern, which is supposedly as old as Yankee Stadium. The walls are filled with memorabilia and photographs of Yankees, although it felt like Jeter was staring at you no matter where you moved. I liked the replica of Yankee Stadium's signature facade that hung from the ceiling of the bar and the fact the menu included a ballpark pretzel. There was an interesting billboard just outside of Yankee Stadium that I was surprised to see. It featured David Wright of the Mets and David Ortiz from the Sox pushing Vitamin Water. How do the stars from the Yankees' two biggest rivals get their faces plastered in the shadows of the stadium? Couldn't imagine seeing A-Rod and Jeter on any billboards around Fenway.